« Calling all Happy Campers! 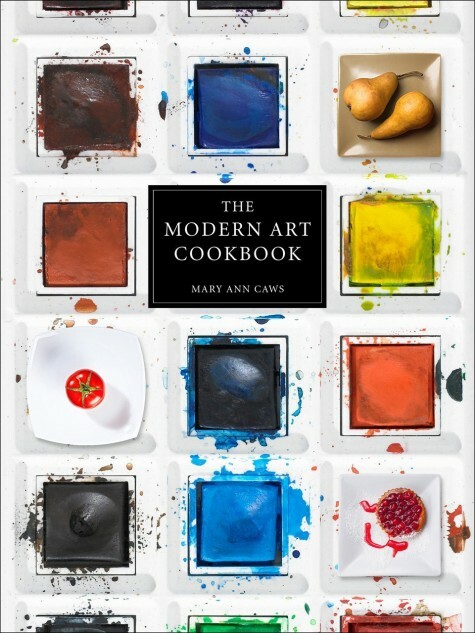 This Friday, cookbook author and professor of comparative literature Dr. Mary Ann Caws will be here to discuss her book The Modern Art Cookbook during our Savor the Arts Late Night event. The Modern Art Cookbook is equal parts art historic document and recipe guide, illuminating the relationship between art and food. In preparation for this event, the DMA’s programming team decided to try some recipes from the book to see what they were like (and to test their kitchen skills). I have always been a fan of the “breakfast for dinner” concept, so I opted to tackle an egg-based dish from the book. 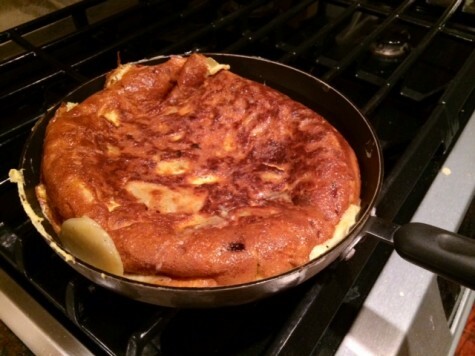 Armed with a minimal set of ingredients—and an even more minimal set of cooking skills—I set aside an evening to bring Pablo Picasso’s Spanish Omelette to life in my kitchen. 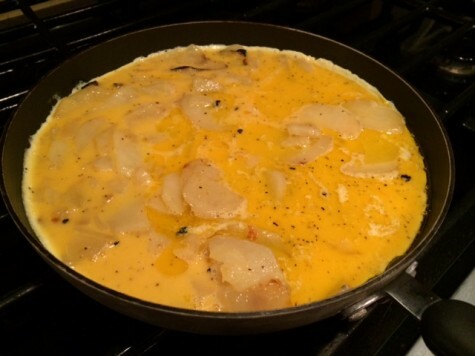 I originally thought the dish would resemble a traditional, half-plate-sized omelette, but as I laid out the ingredients (10 eggs, 4 potatoes, 2 onions, etc. ), I realized this was going to be much larger. 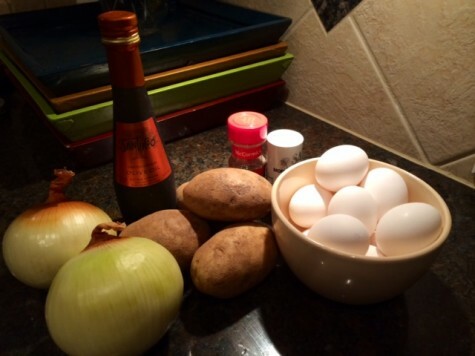 I began by peeling and slicing the potatoes and onions. I then tossed them into a large pan and sautéed them for about 15 minutes. While they were cooking, I beat the eggs in a large mixing bowl. Once the potatoes and onions were beginning to brown, I drained them on some paper towels to help absorb the excess moisture. I then added them to the salad bowl along with a large helping of salt and pepper. Next it was time to make the omelette. I pulled out the best nonstick pan I own, added some olive oil and medium heat, and poured in the contents to cook for several minutes. As the edges began to firm up, I realized the hardest part of the process was yet to come: I somehow had to flip this thing over. I snagged a plate for assistance, and, in a swift movement, transferred most of the contents to the plate and back into the pan. All in all, I’d give my flip an 8 out of 10. I cooked the omelette for another 2-3 minutes. The book instructed to leave the center a little runny, but, unfortunately, I overcooked it a bit. Even so, the end result was quite tasty. 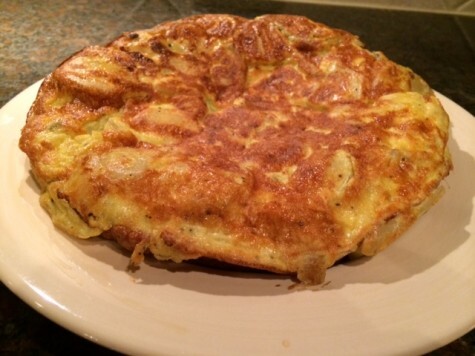 Viva el Spanish Omelette! Things I learned: It’s difficult to ruin an omelette, but there are endless ways to make it better. In the future, I may try adding tomatoes, peppers, and/or salsa to this recipe. I decided to make Brecht’s Favorite Potato Bread because I have always been interested in mastering a bread recipe (yeast and rising dough have always been a bit of a mystery to me). This recipe called for one cube of yeast, which I should have researched before picking this recipe. I tried finding a conversion from cubed yeast to dry yeast and was not successful, so I went with one packet of dried yeast for the recipe. 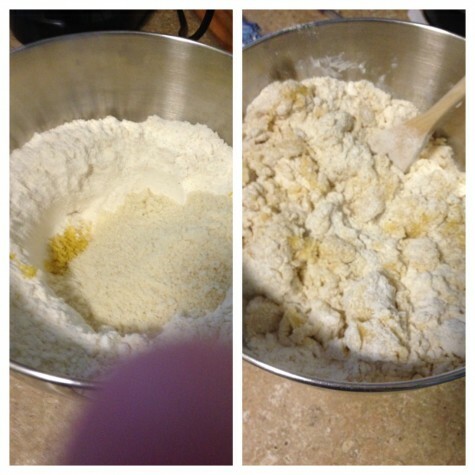 Because dry yeast needs to be activated with water, I reduced the amount of oil recommended. Even with that reduction, my dough was very wet. After adding an additional cup of flour it was still not the texture I thought it should be. But having little experience with bread, and thinking that the mashed potatoes probably added moisture, I thought maybe that was how it was supposed to be. 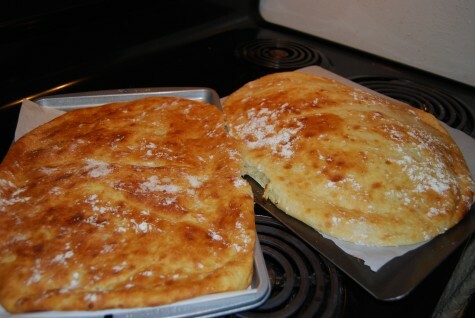 While the look of the bread left much to be desired, I found the flavor interesting, which I attribute to the lemon zest. Things I learned: Yeast used to come in cubes. 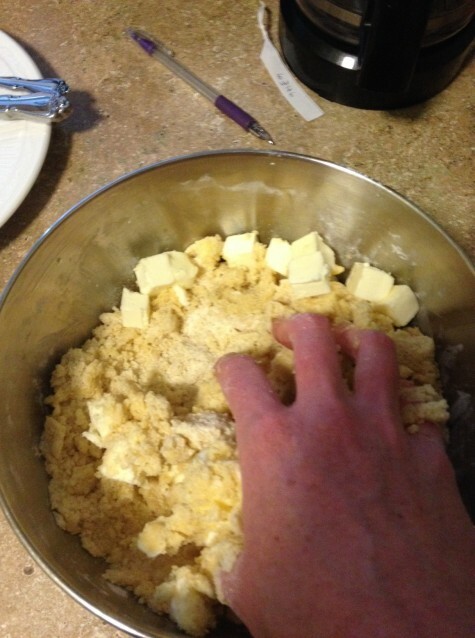 I will add lemon zest to any future bread dough recipes I try. The last time we all got together for a cooking blog, I went with soup, so this time I ventured into the realm of desserts. 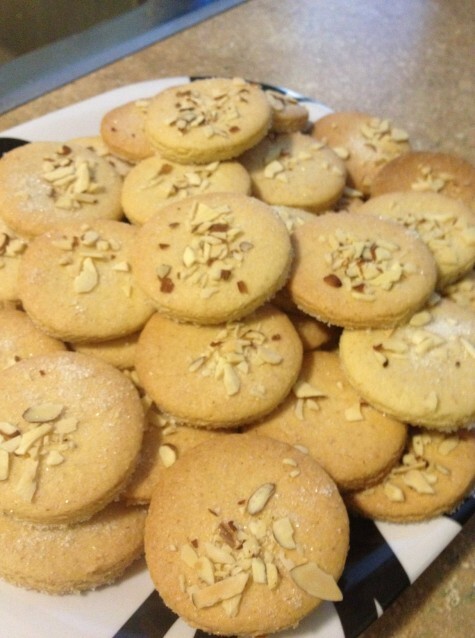 I decided to make Claude Monet’s Almond Cookies. The recipe is much like a shortbread recipe, so there were very few wet ingredients and (something I discovered halfway through) the dough required kneading. 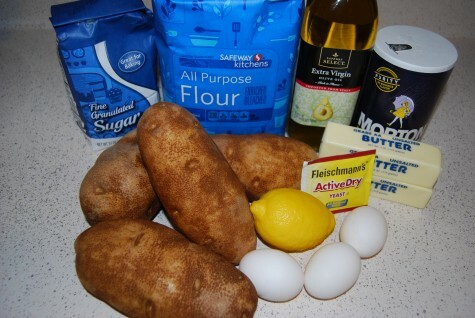 Combining the flour, confectioner’s sugar, ground almonds and lemon rind into a bowl with the eggs was the easy part. Realizing that the cubed butter was still needed, I figured out that my wooden spoon was not going to cut it, so kneading was the way to go! After some work (and one phone call to my mother), I realized I was doing this right, as the dough finally came together. It was on to rolling out the dough and cutting the cookies! 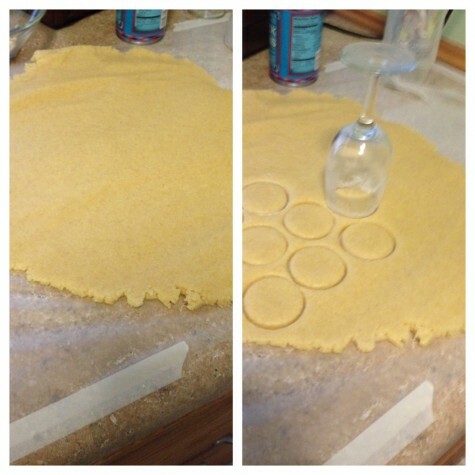 I am a less-than-prepared baker and discovered that, in a pinch, a wine bottle doubles well as a rolling pin and wine glasses are the perfect size for cutting! After I sprinkled the cut cookies with sugar and sliced almonds, they went into the oven for about 20-25 minutes. They came out golden and yummy! The lemon rind really gave them a great flavor, and I decided that these cookies would be great with a cup of coffee and a book. Things I learned: Shortbread-type recipes are harder than they look, but worth it. Lemon rind is a great addition to cookies. Also, thanks Mom. Don’t forget to join us on Friday as we savor the arts! And, for more fun food-inspired posts, peruse the Culinary Canvas section of our Canvas Blog. Betsy Glickman is a manager of adult programming at the DMA. Liz Menz is a manager of adult programming at the DMA.